Wednesday is official ‘club night’ when much of the routine business of running the club is carried out. Sessions run from 6.30pm to 8.30pm according to age and ability; junior members swim during the first hour, while older, more experienced swimmers occupy the later slot. PASC have in place the Long Term Athlete Development (LTAD) programme as recommended by Swim Ireland. What this means is swimmers are assigned to squads in accordance with their ability and swim times across the four key strokes: breast stroke, back crawl, front crawl and butterfly. Time trials are carried out throughout the season to review swimmers’ progress and squad numbers and swimmers are moved as appropriate. Whilst this might mean changes to family arrangements throughout the season as swim times are changed. It is important for the development of individual swimmers and the effectiveness of the club’s competitive teams that swimmers swim in their designated squad times. Swimmers who turn up for other sessions will be turned away. There are five squads in ‘learn to swim’ division: angel fish, goldfish, starfish, dolphins, and sharks. Learn to swim sessions last 30 minutes, running from 6.30pm to 8.30pm each Wednesday night. Swimmers progress through the squads learning the basic techniques. Generally once the swimmer has developed abilities in all four strokes and progressed through the five squads they move to the large pool. It is the coaches’ decision as to when a swimmer moves between the ‘learn to swim’ sessions and when they move to the big pool. The decision is made taking into consideration the PASC squad criteria. There are six squads in the big pool: Yellow, Green, Red, Blue, Silver and Gold. The yellow squad swims for 30 minutes on club night all other squads swim for 1 hour. This may be subject to review and change dependent on the needs of the club always check club notice board for details. The coaches allocate swimmers to a squad based on individual times, skill and stamina. The Squad system is not based on age. Swimmers transfer between Squads based on progress made and according to squad criteria. Time Trials are used to baseline a swimmers progress. The coaches’ decision is final as to which squad a swimmer is allocated to. 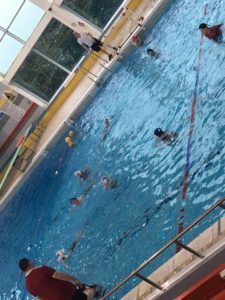 In addition to club night, PASC hire the pool for at least three other sessions per week to enable squads to access additional development sessions. All swimmers are expected to attend as many sessions as possible. Attendance not only increases skills but is crucial to PASC performance in competition. The onus is on parents/guardians and swimmers to be aware of the additional sessions and to attend as many as possible. Attendance is monitored by coaches. 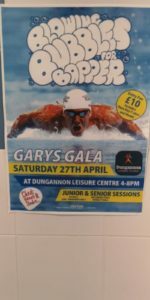 Poor attendance may result in training being withdrawn and/ or swimmers not being selected for gala events. Information or changes to squad training sessions are available on the PASC noticeboard in Cascades Leisure Centre. PASC has two competitive swim teams – ‘Aquasprint’ for younger swimmers up to age 12 and ‘Provincial Teams League’ (PTL). The PASC coaches decide which swimmers make the team and their decision is final. Swimmers are expected to be available and to swim the strokes allocated to them when selected. Failure to attend galas and/ or to notify coaches of non-attendance when selected can mean that a swimmer will not be chosen for future galas.